To a C11 nave, transepts and a south aisle were added in the C12. There is a fine vaulted early C13 chancel and a C15 tower. The village stands above the Arun opposite Arundel, by a large enclosure, which may date from the Iron Age (3 p197). In the C10 Burghal Hideage Burpham was one of five Sussex burhs. The church is listed in Domesday Book (11, 68) and the nave is probably of this period, as shown by a north window, the head made from a single stone, which is set low for the period; there is said to have been a second until 1892 (Fisher p70). 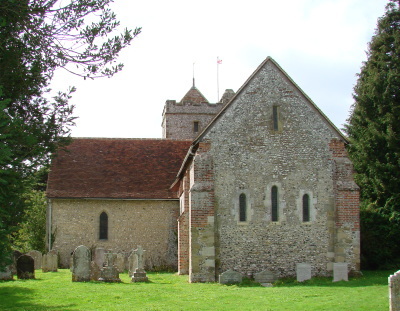 In the earlier C12, a long north transept was added with small round-headed windows, the west one of which has a narrow band of chevrons round the head. The outline of a round-headed arch in the east wall led to an apse, of which foundations were uncovered in 1857 (2 p3). However, it cannot have stood for long, as a late C13 window cuts into the arch. 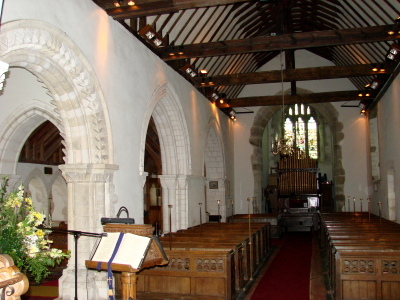 The responds of the arch into the nave are chamfered and the round head is also roll-moulded. The equivalent arch into the south transept is more elaborate, though still round headed, and indicates that the south transept is mid-C12. Its responds have three attached shafts on spurred bases and scallop capitals. The underside of the head is roll-moulded and there are deep cut chevrons and a hoodmould with grotesque heads. The aisle west of this is now C19 and the transept arch forms the easternmost arch of the arcade. Like the other two, which are pointed, it is separated by a stretch of wall, which must be part of the C11 structure. The centre arch has responds like the transept arch, but deeper scallop capitals and its head has two moulded orders. The westernmost arch was inserted very soon after the middle one, for it has a single roll-moulding round the head and responds with angle-shafts and foliage capitals. The arcade provides a study of the development of the arch in the second half of the C12, but it is hard to explain the piecemeal way in which it was inserted. 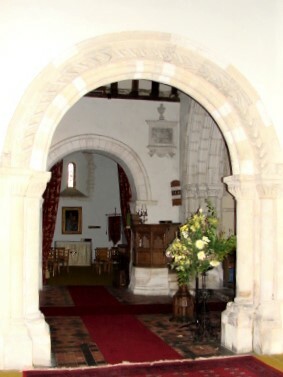 Adelaide Tracy (II p58) shows a round-headed chancel arch with three moulded orders, voussoirs of contrasting colours and responds with foliage capitals. Later C12 in appearance, it was linked with the rebuilding of the chancel with lancets, including three stepped east ones. 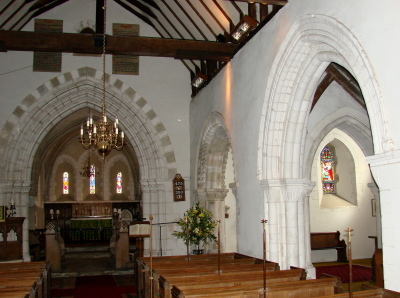 The two-bay chancel-vault has in-filling of clunch and its ribs have two roll-mouldings. At each corner, these rest on corbels and on the walls clustered shafts divide the bays. The sills of the lancets are connected by a string-course, which continues in front of the shafts, an unhappy effect. The deep rere-arches lack scoinsons and show how thick the walls are, to support the vault. The capitals of the vaulting-shafts are decorated with foliage, but one of the otherwise plain corbels has scallops, found at Chichester cathedral by 1185. There would probably have been a delay before it spread to parish churches, but it suggests that the chancel had been started by 1200. 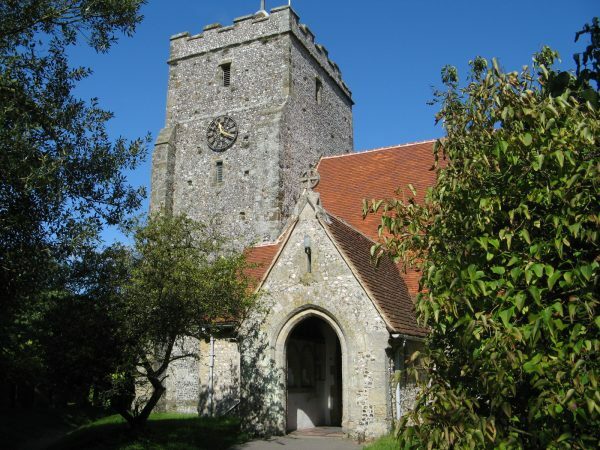 The church belonged to neither the bishop nor the cathedral, so the reason for such fine work is unclear, unless it hearkened back to Burpham’s former status, now lost to Arundel. C13 alterations include the window in the north transept, already mentioned. A quatrefoil in the head shown in the Burrell Collection drawing (1789) has been altered since, for was then much larger. The chancel was altered in the C14, when the side-walls were made thicker and buttressed towards the west end, suggesting structural problems, and a trefoil-headed lowside was inserted to the south. The early C15 tower is built of fine flint and stone chequer, which is best seen on the angle-buttresses; the putlog holes for the scaffolding are visible. It resembles other towers of the period in the area, like Poling and Lyminster, with a cap, square-headed openings and battlements. The west window has panelled tracery and the chamfered head of the tower arch dies into the responds without abaci. The square-headed north east window of the nave, mostly renewed, is of the same date and the main roof-timbers may be also. In 1799 the south transept and aisle were removed (WSRO Ep I/40/34). Nibbs (1851) shows the arcade exposed and blocked. Transept and aisle were replaced at T G Jackson’s restoration in 1868-69 (WSRO Par 31/4/1) on the old foundations in a simple lancet style, with nook-shafts on his arch from aisle to transept. 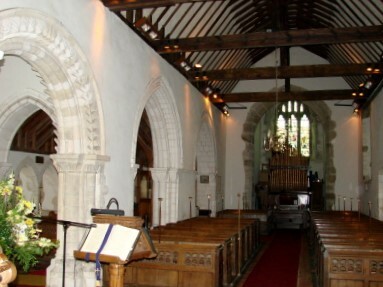 For structural reasons he also replaced the chancel arch and matched it more closely to the chancel, for, unlike its predecessor, the head is pointed and there are foliage capitals. Around the head, recalling the previous arch, Jackson placed a band of variegated stone. He also added a north west window in the nave, copying the C15 one further east, and replaced the porch. Sadly, he did not keep the C15 benches, shown by Nibbs in 1851. Aumbry: (Chancel) Double opening, probably early C13. Font: Early C15 octagonal. Each side of the bowl has a quatrefoil containing a stylised flower and the stem is decorated with trefoils and quatrefoils. 1. (Chancel lowside) Three roundels of C17 German glass. 2. 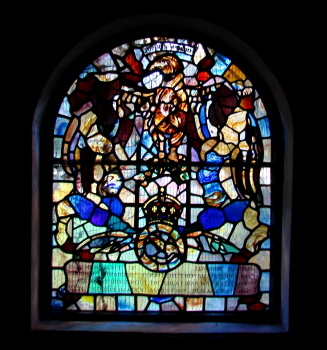 (South transept east and west windows) 1868 and 1870, T Baillie and Co (www.stainedglassrecords.org, retrieved 3/7/2017). 3. (North transept east window) J Powell and Sons, 1875, designed by H Holiday (Hadley) . 4. (North nave, three-light window) J Powell and Sons, 1881, designed by H Holiday (Three Maries) (ibid). 5. (South nave, three lights) J Powell and Sons, designed by J W Brown, 1885 (Order book). 6. (North aisle, third from east) J Powell and Sons, c1891 (ibid). 7. (West window of tower) C E Kempe, 1899. 8. (Blocked north doorway) 1930 by L Walker (WSRO Par 31/4/1 p122). Monument: (By chancel arch) Archdeacon F J Mount (d1903) carved lettering by E Gill (E R Gill p2). Piscina: (Chancel) Roll-moulded and square-headed, probably early C13. Recess: (East wall of chancel) Possibly another aumbry, as it is divided by a shelf.